With the ceremonies and introductions over, it was time to get to work in our committees. At a time when politics can be so divisive, it's important for our elected leaders to come together around the issues facing Oregonians. 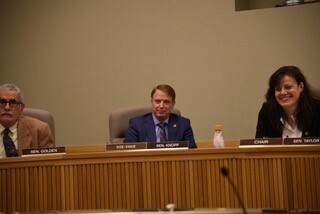 That's why I was proud to testify alongside my colleague, and friend, Senator Sarah Gelser in support of SB 479, a bill designed to address sexual and workplace harassment. I commend Senator Gelser for her advocacy on this issue an look forward to working with her to address it this session. That is why I have taken the #20StatesBy2020 pledge and will work to ensure all people feel safe and respected in their place of work. 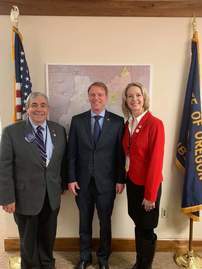 Later in the week, the League of Oregon Cities hosted their annual "City Day" where local and city officials visit the Capitol to discuss local issues with their legislators. It was great to receive a visit from Mayor Endicott and Councilor Clark-Endicott from Redmond! We had a great conversation on how current proposals could impact Redmond and Central Oregon in general. Thank you to both Mayor and Councilor Clark-Endicott for making the trip and for the great conversation. 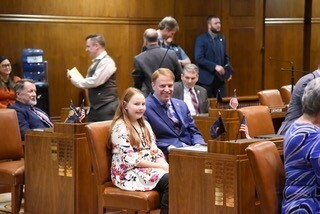 As the Senate met on the floor for the first time this session, I was so happy to be joined by a very special guest: my daughter Grace. Being away from family is one of the most difficult parts of session, so having her make it over the mountains to accompany me meant a lot.